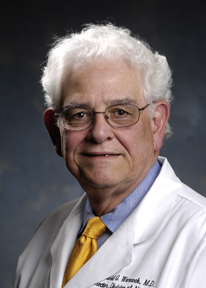 The study’s senior author, UAB nephrologist David G. Warnock, M.D., reported the findings of the BEAM Study, sponsored by Reata Pharmaceuticals, at a late-breaking clinical trials session of the 2011 European Renal Association/European Dialysis and Transplant Association Congress in Prague, Czech Republic. Warnock told the group that bardoxolone methyl, a synthetic antioxidant inflammation modulator, improved kidney function in diabetic patients with chronic kidney disease by up to 30 percent. In the 52-week, double-blind study, 227 patients with moderate to severe chronic kidney disease and Type 2 diabetes were given a placebo, 25mg, 75mg or 150mg dose of bardoloxone methyl once daily. The research team wanted to know if patients taking bardoloxone methyl had a better estimated glomerular filtration rate (eGFR), or rate at which fluid is filtered through the kidneys, at both 24 and 52 weeks than patients taking the placebo and, if so, which dose of the drug produced optimal results. The team found that at both 24 and 52 weeks, the patients on bardoloxone methyl saw an increase in kidney function of 30 percent. The findings also showed that 75 mg was an optimal dose. In January 2010, Reata and Kyowa Hakko Kirin announced a licensing agreement providing KHK with the exclusive rights to develop and commercialize bardoxolone in Japan and other selected Asian markets, according to a Reata spokesperson. In September 2010, Reata formed a strategic partnership with Abbott for the development and commercialization of bardoxolone in other ex-U.S. markets. Reata retained exclusive rights to bardoxolone methyl in the U.S.
Warnock’s co-authors on the paper are Pablo Pergola, M.D., from Renal Associates in San Antonio; Phillip Raskin, M.D., and Robert Toto, M.D., from the University of Texas Southwestern Medical Center in Dallas; Colin Meyer, M.D., J. Warren Huff, J.D., Eric Grossman, M.D., Melissa Krauth, Stacey Ruiz, Ph.D., and Paul Audhya M.D., from Reata Pharmaceuticals in Irving, Texas; and Heidi Christ-Schmidt and Janet Wittes, Ph.D., from Statistics Collaborative in Washington, D.C.
All of the authors of this paper report that they are employees of Reata Pharamaceuticals, or they and/or their institution have a financial tie to the company through consulting fees, stock options, grants or other support. Warnock reported financial and consulting relationships with Reata and a consulting relationship with Abbott.